Ellen DeGeneres ‘shows’ support for Miley Cyrus’ new haircut: Who wears it best? Leave it to Ellen to lighten the negativity coming from Miley’s fans in the wake of her drastic do-over! We know Ellen wouldn’t want us to compare the two, but how can we not?! Even though El’s is obviously fake (with wig and/or Photoshop), we like her version better. In fact, we’re hoping Ms. DeG copies it someday. We’re not sure why we like the copycat coif better…maybe it’s softer because the side isn’t shaved and the color is the same all over. One criticism, though: Elle’s look is wig-ish. 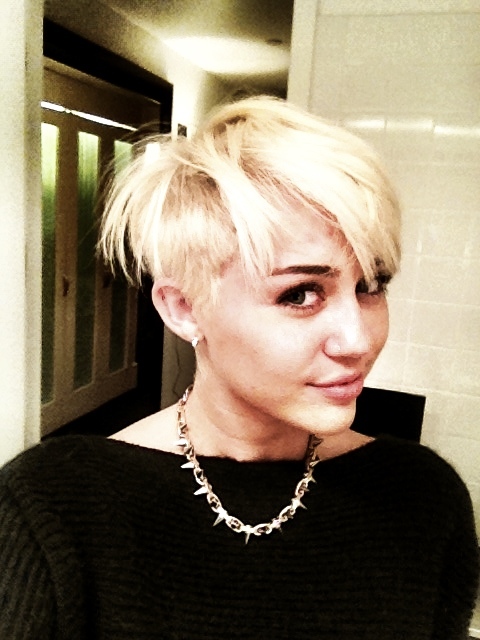 In Miley’s defense, the cut is cute with its choppy, lifted layers and longer bangs. The slight variations in blond add dimension and a “real” feel. In short, the imitation was an obvious punk for the funny girl whose hair is sort of like Miley’s to begin with–short and very light blond. 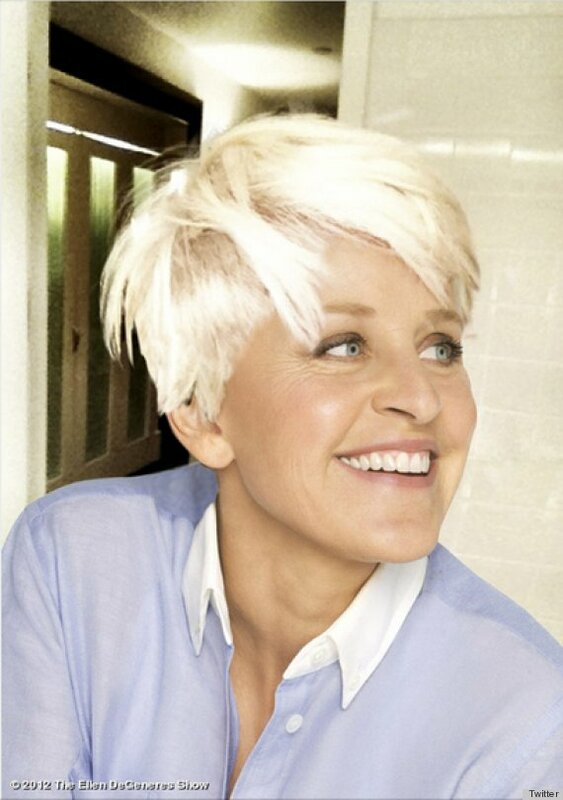 But the truth is Ellen has proven that imitation is truly a form of flattery. In the poll below we have offered an answer that reflects the flood of news that has come forth comparing Miley’s new haircut to those of former Spice Girl Victoria and Gold Medal Olympian Megan. We’ve thrown in Pink because she has worn similar looks in the past, and they look great on her! Please let us know your opinion and thank you in advance. OMG! Miley Cyrus’ hair is super short and platinum blond. Do you like it? Just when we thought Miley Cyrus had done it all, she made her boldest style move to date! On Sunday Miley did something that was heard around the world: she had her hair cut into a pixie with a buzz on the side. While the drastic makeover seems spur-of-the-moment, it’s not. 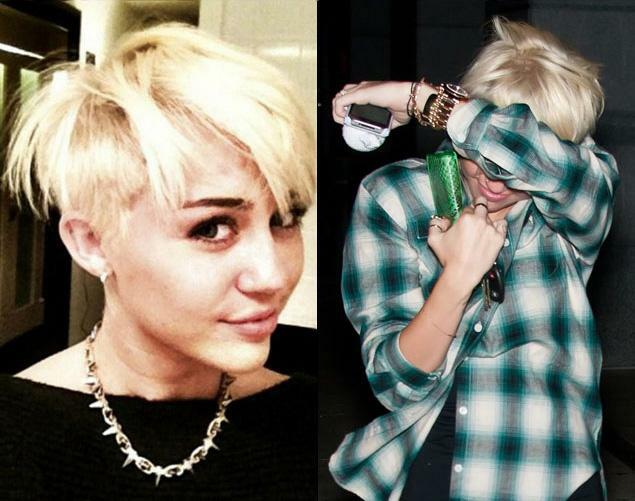 On August 6 Miley tweeted photos of herself in shoulder-length, white blond locks. Hairstylist Chris McMillan did the honors on both of the new dos. McMillan is famous for creating “The Rachel” for Jennifer Aniston, and Miley asked him for something similar. She got a pretty Rachel-like lob (long bob), but that was only a preview of what was to come. 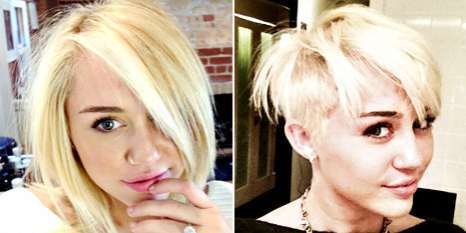 Just a week later, Chris completed the Miley makeover that conjures up images of Victoria “Posh” Beckham. Even before the latest do-overs, Miley was taking mini steps toward the big change. On July 14 she sent followers the photo above right to announce that she had gone blond. If you’re wondering why she’s puckering up, Miley explains, “Now that I’m blonde I gotta give duck lips in every photo.” The photo on left was taken in between then and the top two dos. While there’s been a wild mix of reactions to the final cut, there seems to be consensus that it was time for that high bun to go! While we were finishing this post, rumors had already started circulating that Miley is hiding her new hair or maybe regretting it. Personally we think she was trying to avoid the paparazzi while walking with her fiance. It will be interesting to see how long Miley will keep the do before grabbing onto some extensions. And since she and Liam are planning a long engagement, anything can happen before the wedding.